A mellow acoustic experience. Kinda like if Dan Fogelberg and John Denver joined the Moody Blues? A contemplative concept album. The songs on “Life's Road” were originally written between 1972 & 1977. My goal was to achieve an organic yet dreamlike quality by blending acoustic and other instruments with meaningful vocals and spacious harmonies. I played all the instruments and sang all vocals except on songs 4 & 7 where I'm joined by the Rosier brothers. These songs were not written with commercial expectations but with honesty and in pursuit of the “Common Chord”. They are arranged lyrically and musically with the intent of taking you on a thoughtful inner journey. 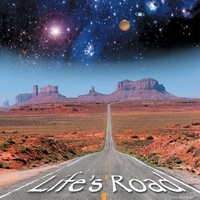 So, light up the lava lamp and scented candles, sit back and see where “Life's Road” takes you.